Fall Webworm (Hyphantria cunea) has two generations per season in Ohio. The "fall" in the webworm's common name is based on the appearance of second generation nests late in the season. The first generation began to appear in southern Ohio in late May (see, "Spring, Summer, Fall Webworms," June 13, 2018) and second generation caterpillars are now on the scene. Localized fall webworm populations are high in some parts the state with silk nests becoming more evident as they undergo late-summer expansion. The wide host range for this native moth is also apparent with the branches of a diverse variety of trees and shrubs shrouded with silk. Fall webworm caterpillars only eat leaves that are enveloped within their silk nests. They feed in groups beneath their protective webbing on either the upper or lower leaf surfaces consuming everything except the opposite leaf epidermis and the leaf veins. Their skeletonizing damage causes leaves to turn brown making their nests even more obvious. As caterpillars grow in size, they expand their nest by casting silk over an increasing number of leaves to accommodate their expanding appetites. Nests also grow in size between the first and second generations. First generation female moths often lay their eggs on or near the nests from which they developed. The resulting second generation caterpillars then expand the nests once occupied by first generation caterpillars. The ultimate nest size depends on the webworm biotype. Fall webworms come in two distinct forms, known as biotypes, which are named for the color of the caterpillar's head capsule: black-headed and red-headed. Caterpillars of both biotypes are very hairy, but differ in body coloration, nesting behavior, dates for spring adult emergence, and to some extent, host preferences. Indeed, some entomologists are proposing that these biotypes should be considered different species or subspecies. The two biotypes are more than an entomological curiosity. Black-headed fall webworm nests appear to include caterpillars from only a few overwintered egg masses. They tend to produce small, wispy nests that envelop only a dozen or so leaves. However, it is not uncommon for several of these small communal nests to be found on the same branch. Red-headed fall caterpillars are far more cooperative; their communal nests may include caterpillars from a large number of egg masses. Thus, they can produce some truly spectacular multilayered nests enveloping the leaves on entire branches. This biotype is the more damaging of the two. Historically, the red-headed biotype was confined to the northeast and eastern parts of Ohio and black-headed caterpillars were found elsewhere in the state. This is the reverse of the distribution of fall webworm biotypes in the U.S. with the red-headed biotype dominating the southern states. However, in 2016, I found the red-headed biotype in Miami Whitewater Forest (Great Parks of Hamilton County) in southwest Ohio. I also them last season in Mt. Airy Forest which is part of the Cincinnati Parks system. I have no idea whether they arrived from the north or the south. 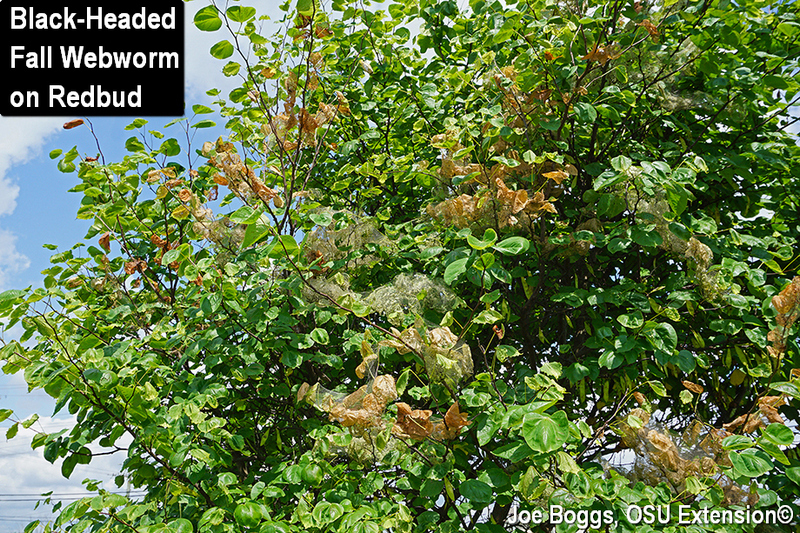 But, it means we may expect more damage in the future from fall webworms in southwest Ohio. Fall webworm caterpillars have been recorded on over 400 species of trees and shrubs; they are particularly damaging on fruit trees. However, insecticide applications should be used sparingly in landscapes and urban forests because their application may kill bio‑allies that help keep population densities of this native insects in check. Fall webworms are native to North America and there are over 50 species of parasitoids, and 36 species of predators known to make a living on fall webworms. Indeed, it is not unusual to observe fall webworm nests being invaded by a compliment of hungry predators including wasps and predacious stink bugs. These and other beneficial insects are very effective in reducing year‑to‑year populations of this defoliator. If nests are few in number and easily accessible, the best control approach is to apply a 3-step management option aimed at physically removing and destroying the nests and caterpillars. This IPM strategy is highly effective and thus far, no populations have become resistant. I've demonstrated this approach in the images below.